Metal and glass accentuate Chicago high-rise's iconic form. Given the odds stacked against it, Godfrey Hotel's 2014 opening in Chicago counts as a major victory—even if it took more than a decade to get there. Valerio Dewalt Train Associates (VDTA) signed on to the project in 2003, after being approached by a developer affiliated with a mid-market hospitality chain. Four years later, following a delay in financing, construction was finally underway. Then the recession hit, the original developer went under, and the building remained half-finished. The case languished in bankruptcy court until 2012, when Oxford Capital Group purchased the property. Fortunately, boutique hotel operator Oxford Hotels and Resorts hired VDTA to complete the project—with few changes to the original plans. "It's interesting that through the course of the almost four years that this sat wrapped in tarps, it remained desirable," said VDTA's David Jennerjahn. "For the hotel operator, it was a really distinguishing architectural design." Together with its cantilevered form, Godfrey hotel's slick metal panel and glass facade combines function and aesthetics in an iconic package. The hotel appears as a series of three offset rectangular boxes, stacked vertically. "The building has a very symbolic form—what I would call a very muscular form—and none of that is arbitrary," said VDTA's Joe Valerio. The offsets serve two purposes. First, they express the building's structure, which follows the staggered truss system developed in the 1960s by William LeMessurier, a noted structural engineer. As the name suggests, LeMessurier's method involves staggering story-high steel trusses on alternating column lines, thus creating large clear span interiors. Though the staggered truss system is usually deployed to create buildings that "look like a cereal box," said Valerio, VDTA approached their structural engineer with an alternative proposal. "We nonchalantly said, 'There's a lot of redundant strength there. [The volumes] should be able to cantilever out,'" he recalled. The structural engineer gave them the go-ahead, and Godfrey Hotel's unique form was born. As an additional benefit, the stacked configuration allowed the architects to carve the interior spaces into a variety of room types and sizes, an idea they prized from the project's beginning—and which Oxford Hotels and Resorts, in particular, embraced. Like the offsets, said Jennerjahn, the building's skin performs a specific set of functions even as it "works toward the goal of creating a distinctive boutique hotel image." On the north and south facades, an insulated metal panel system from Metl-Span attaches directly to the stud work, doing triple duty as weather barrier, vapor barrier, and insulation. Integrated punched windows nod to the River North neighborhood's masonry fabric, while the panels' taut surface avoids detracting attention from the building's unique shape. Finally, said Jennerjahn, "using a metal skin on a metal frame building was another tie to an honest expression [of the structure]." The east and west facades are almost entirely transparent. "In 2003, no one had heard of LEED," said Valerio. Noting the potential for solar gain, he explained, "If we were designing the building today, we wouldn't have all-glass walls on the east and west elevations. We put them there because we wanted to take advantage of the views." The glass also reveals the staggered truss system. Because the trusses run north-south, opening the building to the east and west was the only way to show them off. "That created other opportunities we did not even think of," said Valerio. In some cases, he said, "the trusses really become a part of the room," operating as built-in furniture. Despite the change in ownership and an eleven-year gap between conception and execution, Godfrey Hotel's architectural design remained almost entirely unaltered. "There were some changes internally, but the exterior of the building and the expression of the building were very consistent," observed Jennerjahn. Valerio agrees—and is humble enough to acknowledge the unusual serendipity of the situation. "Oxford fundamentally built the hotel exactly as we had designed it," he said. "It was really just an amazing kind of dumb luck." Curved curtain wall and textured composite rain screen create a new focal point on the Hamilton College campus. When a team of architects from Boston-based Machado and Silvetti Associates first visited Hamilton College several years ago, they thought they were interviewing for a single project—an art museum. But they soon found themselves talking campus officials into a second commission, for the Kennedy Center for Theatre and Studio Arts (KCTSA). "They talked about how important it was to coordinate the museum with proposed studio arts building," recalled Machado and Silvetti's Edwin Goodell. "We made the plug that they could be designed by the same firm." The college agreed and tasked the architects with designing both spaces, which together form a new arts district on the Clinton, New York, campus. The larger and more recently completed of the two buildings, the KCTSA invites engagement with the thriving arts program through a curved glass curtain wall, while concrete panels and locally sourced stone protect the students' workspaces and pay homage to historic Hamilton architecture. The Ruth and Elmer Wellin Museum of Art and the KCTSA were originally sited on opposite sides of campus. But a rearrangement of the construction timeline necessitated a new location for the museum. "That allowed us to place it where it wanted to be, across from the studio arts building," said Goodell. "It allowed us to start thinking about the area as an arts lawn." At the time, the lot on which the KCTSA now stands was punctured by a muddy pond. "It was an eyesore, and not something people thought of as an amenity," explained Goodell. Seeing an opportunity to create a campus focal point, Machado and Silvetti worked with landscape architects Reed Hilderbrand to transform the pond into a sparkling water feature. To suggest an embrace of the new green space, and to reduce the impact of the studio arts building's large scale, the architects pushed the structure to the southern edge of the site. The KCTSA program comprises a disparate array of studio and performing arts uses. 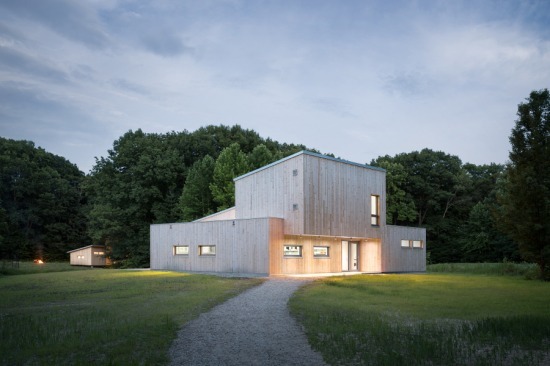 Luckily, Machado and Silvetti had recent experience with just such a complicated mix on a similar project, the Black Family Visual Arts Center at Dartmouth. There, the architects took a neighborhood-based approach, addressing each distinct set of requirements through strategic adjacencies—placing the print-making classrooms and support spaces together in a back chemistry corridor, and keeping the workshop separate from the digital media labs to reduce sound transfer. But the neighborhood solution came at a cost. "What we learned at Dartmouth is that this generally leads to a rabbit's warren of a plan," explained Goodell. For the Black Family Center, Machado and Silvetti untangled the mess by way of a central arts forum, off of which each neighborhood had its own "front door." At Hamilton College, they opted instead for a glass corridor wrapped around the north edge of the building. "It became clear that having one unifying element on the north facade was a critical move," said Goodell. "The glass wall is that major architectural gesture." In addition, he explained, "especially at dusk, you see the senior studio students working, you see the theater lobby being used by various groups, you see people circulating down the corridor. It's a very activated facade, and that light and activity spills into the landscape, making it a friendly space." The architects considered a structural glass curtain wall system but soon decided that an entirely unbroken wall would be "a little too slick, almost corporate," said Goodell. They went instead with a more simple system featuring double glazing and a thermally broken frame. Machado and Silvetti carefully controlled the width of the spandrels and the alignment of doors along the back wall of the corridors to reduce the appearance of horizontal banding. "We wanted it to read as full height, and I think it does in most light conditions," concluded Goodell. Most of the space behind the curtain wall is dedicated to circulation, requiring little in the way of sun control. In the affected studio and classroom spaces the team provided a combination of motorized and manual shades. Unlike on the north, on the south facade "all program types are sun sensitive, so the wall wanted to be much more protective, with discrete apertures where it was beneficial to the programs," said Goodell. The architects selected a concrete rain screen solution from Taktl for several reasons. The material allowed them to gesture toward the nearby cluster of buildings designed by Benjamin Thompson during the 1950s (originally Kirkland College). The ability to add texture to the panels, meanwhile, presented an opportunity to evoke the site's landscape, which once included a dense grove of trees. That history "inspired us to create something that had that type of verticality," explained Goodell. The vertical ribs also play to Hamilton College's unique weather effects, altering the facade's appearance depending on the angle of light and amount of moisture in the air. The KCTSA's theater volumes are clad in stone from a nearby quarry. "Incorporating stone was important for many people at Hamilton," said Goodell, explaining that many of the campus' older buildings were built from the material. In search of a local product with the requisite strength, Machado and Silvetti hit upon Alcove Bluestone. "It was an important historical reference, but it also brings color and warmth," said Goodell. "Artists tend to like white walls, so we had limited options to do color in the building; the stone in the theaters is critical. As you ascend through the lobby, the stone really becomes a dominant material around the whole center of the building." Outside, the visual magic continues. Though the curtain wall as a whole describes a broad curve, the individual panes of glass facing the pond are flat. As a result, the building's natural surroundings bounce back to the viewer in unexpected ways. "It creates amazing reflections," said Goodell. "We kept thinking we'd done something wrong in our renderings because you'd see these rippling effects. It takes the already lush landscape and magnifies it." 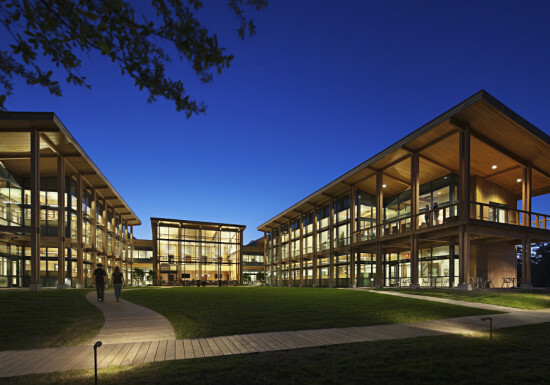 Wood siding and high performance glazing invite nature into the workplace. For their new headquarters in Wilmington, North Carolina, Live Oak Bank's leadership sought a design that reflected the institution's unique culture, particularly its focus on cultivating meaningful relationships with both customers and employees. "Their employees work hard," reflected LS3P's Laura Miller, whose firm was selected to design the building after a small local competition. "The folks who run Live Oak Bank want to recognize that." At the same time, she said, "they wanted it to be somewhat unassuming as well. They want to just quietly go about their business, and be the best at what they do." The architects' solution, a two-story U-shaped structure clad in local cypress and high performance glass, gives equal measure to both concerns. Plentiful glazing maximizes daylighting and views for occupants, while the long wood facades are designed to reflect attention back to the natural environment, further integrating the building into the site as the material weathers. The headquarters building's previously undeveloped site was a perfect fit for the project brief. Located in the heart of the city, the parcel is nonetheless adjacent to a nature preserve. "It's a little island of tranquility in the middle of Wilmington," said Miller. "It's convenient, but once you enter it, you feel like you're in a secluded, calm environment." Unlike the traditional office block, LS3P arranged the interior program in a U shape around a central courtyard. "It's not the most efficient in terms of square footage, but the bank wanted every single employee to have beautiful views either to the lake or to the grove of live oak trees," explained Miller. Courtyard terraces, decks, and a full-length second-floor balcony can be used as workspaces on nice days, and further encourage a dialogue between indoors and out. In light of Live Oak Bank's desire for a building that blends into the natural environment, the architects gravitated toward wood siding. "We looked at quite a few images with different types of wood," said Miller. "Cedar is often used for building exteriors, but it's not something you find naturally here in eastern North Carolina." Instead, LS3P chose cypress, a local product that ages gracefully. Because they had a contractor on board right away, the architects were able to construct a series of mockup walls on the site even before it was cleared, demonstrating the appearance of the siding at installation, after one year, and after ten years. Per the client's wishes, LS3P designed the bank headquarters to provide every employee with daylighting and views. But the large amount of glazing that resulted presented a potential problem with thermal gain, especially on the south-facing facade. The architects selected a high performance glass, further protecting against glare and solar gain with fixed sunshades. Tested through a series of sun studies in Revit, the airfoil-shaped shades are integrated directly into the curtain wall system. Interior motorized blinds provide an additional layer of environmental control. On the stair towers and at the main entry, the architects offset the wood siding with grey metal panels. "The company is growing so quickly that we were constantly adjusting the design to accommodate more people," said Miller, noted that the project's square footage more than doubled between concept and construction. "The two legs of the U got pretty long. We wanted to break up the long horizontal facade, but we didn't want it to be jarring." Instead, the metal panels match the curtain wall framing and stucco base, maintaining the project's neutral palette. Live Oak Bank's new home does not look like the headquarters of a national bank. Rather, it looks like a comfortable place to work and visit, a place where ego takes a backseat to service. Fortunately, that is exactly what the project's clients—and its architects—wanted. "It's not a typical bank where people just drive through and get their cash," said Miller. "Their bank is really more about customer service and employee satisfaction." Barkow Leibinger's original scheme for HAWE-Werk Kaufbeuren, developed for a competition several years ago, was "a completely crazy origami thing," recalled partner Frank Barkow. But upon winning the commission and learning that the factory's owners wished to build it in a single phase, "we had to be careful not to kill them with the budget," he said. "We really dumbed it down." The architects did, however, hold on to their original pinwheel plan, with production wings rotating around a communal courtyard. 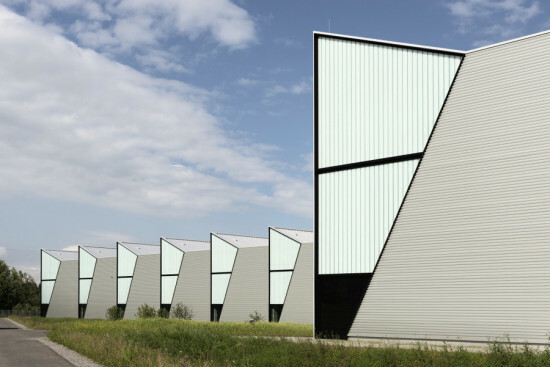 Inspired by Le Corbusier's "green factory"—a humanizing alternative to the "black factories" of the nineteenth century, which prioritized the flow of goods over the experience of the workers—Barkow Leibinger's design opens the HAWE plant to the Bavarian countryside with a geometric facade of corrugated metal and glass. In addition to drawing upon Le Corbusier's "green factory" concept, Barkow Leibinger also looked at industrial designs out of northern Italy in the 1960s and 70s, which in turn led them to experiment with a prefabricated concrete frame. "Usually we do steel," explained Barkow, "but in this case the client liked the precast concrete. It's a dirty industry—there's a lot of milling going on." The factory's exposed mechanical systems are integrated directly into the structure, passing through perforations in the horizontal beams. "It's not a very finicky factory," said Barkow. "We just put it where they needed it." Steel-framed shed roofs sit atop the concrete. Skylights look to the north, while the roof's south slopes are designed to accommodate photovoltaic panels. "The north-facing shed is a classical industrial solution," noted Barkow. "It brings in a lot of light, and saves a lot on artificial lighting." The arrangement of solids and voids on the facade emphasizes the resulting sawtooth profile. The architects carved the envelope into a repeating pattern of triangles and trapezoids, clad in glass and corrugated sheet metal, respectively. Most of the building's glazed surface is translucent white channel glass, with vision glass in the sliver of space closest to the ground. At the end of each wing, a broad horizontal window features a larger central section of channel glass framed by floor-to-ceiling panels of transparent glass to either side. "This is a kind of Corbusian idea: large end facades that look into the countryside," said Barkow. The factory wings are designed to be expansible, the end facade deconstructed and then rebuilt after the installation of additional bays. Barkow Leibinger gave HAWE-Werk Kaufbeuren's extra-production facilities distinct treatments. The lobby and office area is "a more blocky structure," said Barkow, with a transparent curtain wall. The cafeteria, too, plays up the connection to the courtyard with plentiful glazing. The architects designed the "edge spaces'" facades to contrast—but not clash with—the factory floor, explained Barkow. "They're adjacent spaces, but quieter and cleaner." HAWE-Werk Kaufbeuren earned a silver rating from the DGNB (German Sustainable Building Council) thanks in part to the architects' emphasis on daylighting and use of triple glazing, plus careful attention to the window-to-wall ratio. "Nothing spectacularly complex" was involved in the sustainability strategy, said Barkow. Indeed, the very simplicity of the design led to its success, practically and conceptually as well as in terms of environmental performance. From a complicated initial scheme to their final, streamlined, solution, Barkow Leibinger pared the plan and material palette to the bare essentials, with an eye to speeding construction while keeping the "green factory" ideal at the fore. "It's a large project in this landscape," said Barkow. "It's at a different scale, and more robust, than the factories we typically work on." The newly-erected Glass Wall at São Paulo–based fine dining establishment Tre Bicchieri is one of those why-didn’t-someone-think-of-this-before feats of artistry. 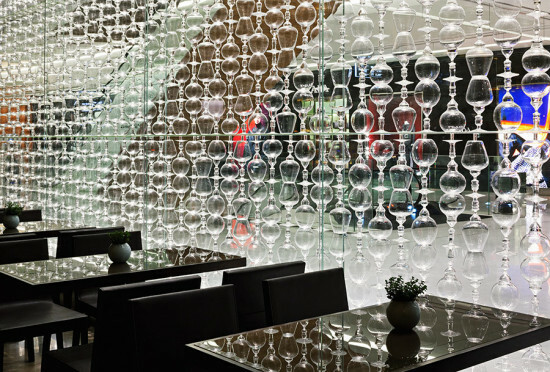 A wall of glass in the most literal sense, the new facade fronting the Italian eatery is composed of 950 wine glasses stacked bowl-to-bowl and stem-to-stem. Parisian luxury architecture firm Carbondale, responsible for luxury brand showrooms across Europe and Asia including BMW, Louis Vuitton, and Longchamp, commissioned craftsmen in Murano, Italy, a region revered for its glass-making, to create three types of hand-blown wine glasses based on the facial profiles of the restaurant’s three proprietors. Being handmade, each glass differs slightly from the others. Carbondale then enlisted a Brazilian glass specialist to attach each glass using invisible ultraviolet glue. While Glass Wall appears unnervingly prone to disaster in photos, as if an errant elbow could send it crashing down, the columns of glasses are actually mounted on ultra-clear glass shelves sandwiched in an airtight space between two layers of facade glass, so it’s less of a house of cards than it looks. The glasses glow with the illumination of LED lights integrated into the frame, which is equipped with sensors that adjust light intensity according to vacillations in natural light. At once an art piece and a veil of privacy for diners from passersby, Glass Wall strikes a balance between translucency and opacity. 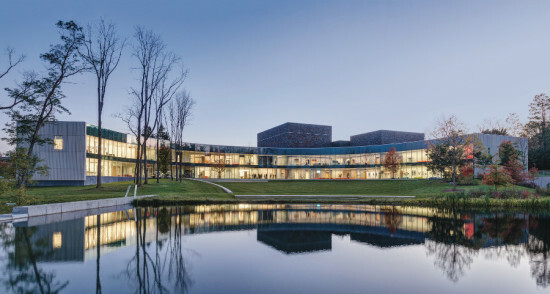 When Farmingdale State College administrators commissioned Urbahn Architects to design a new building for the School of Business, they positioned it as a beacon for the school's shift in focus from agriculture to science and technology. But the architects saw a second opportunity in the project: a chance to restore some of the coherence lost during successive campus expansions. "While the building mission, program, and design look forward, the facade includes gestures that preserve its connection with the college's roots," explained Urbahn's Peter Verne. With a high-performance envelope characterized by a checkerboard pattern of concrete composite panels and glazing, the School of Business building achieves a delicate balance between FSC's history and its future. Besides housing the first classrooms on campus equipped with cutting-edge audiovisual technology, the School of Business was designed to foster a new, conversational mode of exchange among faculty and students. "The dean felt strongly that the building should promote casual interaction" among its users, said Verne. To this end, the architects arranged the faculty offices along the front of the building, directly across a circulation spine from the classrooms. 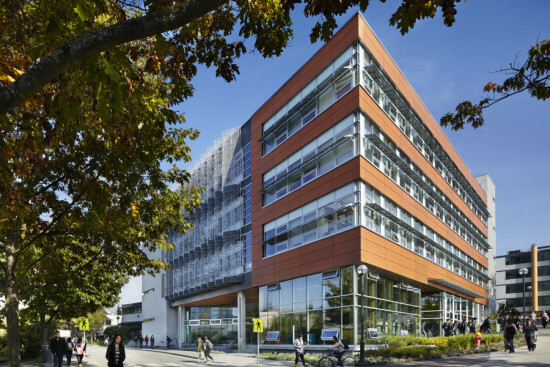 The main facade's variable array of Taktl panels and windows "was designed to reflect the office program," said Verne. "The vertical orientation of the panels and glazing suggests a series of smaller spaces within, akin to monastic cells." 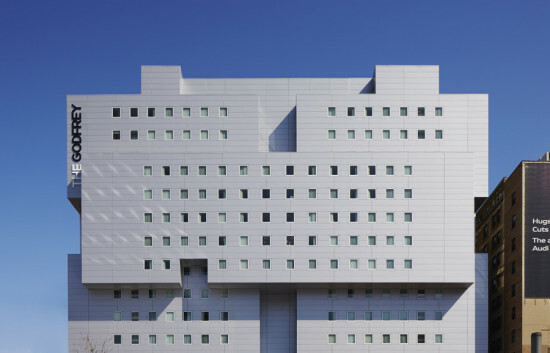 Urbahn developed the pattern of solids and voids "through a combination of rigor and intuition," he explained, adjusting the window widths to animate the face of the building. The building's larger glazed elements provide visual connections to the historic FSC campus. A full-height curtain wall on the main facade looks out to The Mall, the main academic quadrangle, whose coherence was compromised by the demolition of an older structure. Meanwhile, curtain wall-clad cantilevered lounges at the northeast end of the building, which Verne described as "contemplative treetop-level spaces," face the original heart of the college, including the central ellipse and ornamental gardens. "While past development has steadily moved campus activity to the south and west, this gesture is intended to help reconnect the campus population with its origins and re-energize the historic campus center," said Verne. At the main entrance to the School of Business, a free-standing elevator shaft wrapped in faceted metal panels projects from the facade, reinforcing the exchange between interior and exterior. Urbahn selected the envelope's materials to refer back to different stages of campus growth. 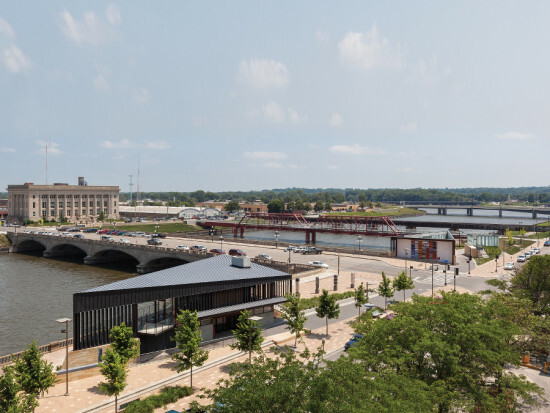 "We chose to respect [the historic] palette, updated to reflect a modern understanding of building expression and current building technology," said Verne. 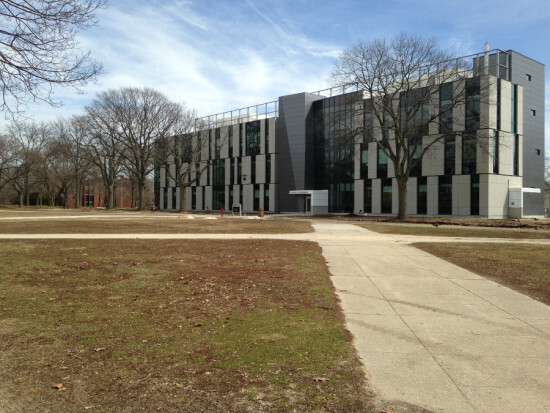 The classroom facade, whose horizontal emphasis—delivered through a cantilevered third floor—distinguishes it from the office facade, is clad in brick to echo the first buildings constructed at FSC. Charcoal mica finish aluminum composite (ACM) panels surrounding the stairs and elevator shaft similarly draw on the earliest era of campus building. The material's "iridescence reflects that of the slate roofs on the nearby historic buildings," explained Verne. Even the concrete composite facade was inspired by historic precedent, namely the Brutalist buildings constructed at FSC during the 1960s and 70s. Throughout their exploration of FSC history, the architects nonetheless remained committed to the dean's goal of reinventing academic dialogue. "I love how much the building design both shapes and is shaped by social interaction," said Verne. "Ever since the main facade began to take its final configuration, I've enjoyed imagining the negotiations between professors and administration over who gets the offices with the bigger windows." Commissioned to design Marc Jacobs' flagship Tokyo store, Jaklitsch/Gardner Architects' first order of business was to rectify the desire for an iconic urban presence with strict local regulations. To make the 2,800-square-meter shop more visible from nearby Omotesando Street, the architects took advantage of a loophole in the building code that allowed them to double the height of the structure as long as the top half was not occupiable. The catch was that the code required a 500-millimeter gap between the occupiable and non-occupiable spaces. "Our first strategy was to create a louvered facade system that would disguise [the divide]," recalled principal Stephan Jaklitsch. But after an afternoon walk through the Imperial gardens, they reversed course. "We were inspired by the vernacular architecture," said project architect Jonathan Kirk. "We wanted to somehow utilize the language of proportions, but also the materiality within that experience. Rather than trying to create something that was monolithic, we began to look at different materials for each of the building's components." 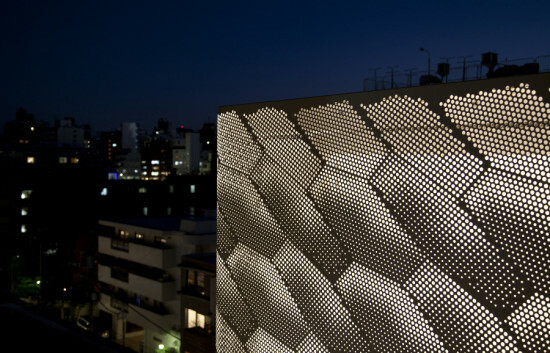 The result, called Tōrō Ishi Ku (lantern-rock-void), makes its mark on the city with a tripartite facade in punched aluminum, bespoke tile, and glass. The top, non-occupiable half of the store is wrapped in stamped aluminum panels. Jaklitsch came up with the idea of a patterned two-dimensional facade after a trip to Prague Castle. "There was a smooth facade, but it employed a visual trick to deliver an illusion of depth," he said. "We were in a sense doing the same thing [in Tokyo]. It looks like a quilted facade, and appears to wrap around seamlessly." The texture of small punched holes was derived from a method of fabrication common throughout Tokyo. Behind the aluminum, the architects installed a fabric scrim that in turn reflects light from a series of LEDs, so that the upper portion of the building—the tōrō, or lantern—glows at night. A second optical illusion concerns the size of the aluminum panels themselves. Each large rectangular aluminum panel in fact comprises four separate aluminum pieces bolted together. Deep reveal seams between each four-part component result from turning the edges over to create rigidity, and also allow for thermal expansion and movement during seismic activity. "What ends up looking very simple in presentation is actually quite complex," said Kirk. Jaklitsch/Gardner defined the central portion of the building—the ishi, or "rock" containing a ready-to-wear showroom—with an opaque rain screen of bespoke tile. The building falls within a fire zone, so the architects were restricted to either fire glass or a non-combustible material. "Because it was also a more private program, and because we were dealing with various conditions in the adjacent buildings, we clad the entire thing in porcelain tile," explained Kirk. The sole exceptions are a single window on each of the building's east and west faces. The blade-shaped tiles were made from molds with a score joint in the middle. 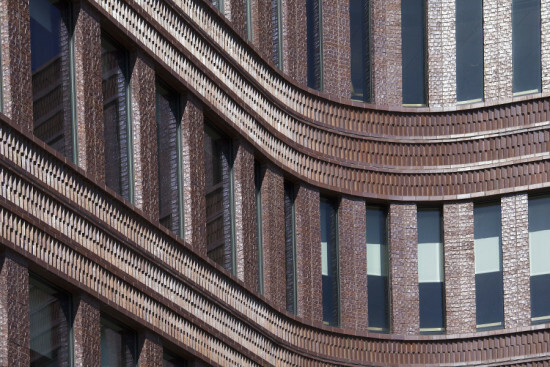 Each larger component was broken in two to create bespoke texturing along two edges; the half-tiles were then randomized and arranged in offset rows to form an interlocking pattern at the building's corners. Facade Installer Kitano Construction Corp. The architects had originally intended to adhere the tile directly to the second floor's extruded concrete exterior, but the porcelain proved too heavy. Instead, they worked with the manufacturer to develop a custom fixing solution, in which the tiles are held off the wall by a series of metal studs. As a result, said Kirk, "the tiles can appear continuous across the concrete panels, which have seams about every three feet. The tiles are independent of the seams because the mounting brackets aren't affected by them." Like the aluminum panels above, the tiles are designed to move freely in case of an earthquake. Tōrō Ishi Ku's "void"—its ground-floor display room—is a transparent glass box. "We went through a number of different studies to get the proportions of the first and second floor just right," said Jaklitsch. The architects discovered that by restricting the height to three meters, they could eliminate the need for anchoring fins, thus increasing the sense of openness to the surrounding buildings. The feeling of continuity between inside and out is further emphasized by the use of honed granite for both the interior floor and the surrounding sidewalks. In this case, Jaklitsch/Gardner's sleight-of-hand worked too well. After several pedestrians collided with the glass, the architects modified the design by applying a subtle vertical striping to the exterior glass at eye level. One final consideration helped shape the shop's unique envelope: the rapidity with which the surrounding built environment is changing. The life expectancy of structures in the area averages only 26 years, explained Jaklitsch. Even as they were designing Tōrō Ishi Ku, the building across the street was torn down. "It became a matter of balancing the massing with this transitional zone between the commercial and residential districts," he said. "We were trying to anticipate the next three chess moves in this urban game." The undergraduate architecture students enrolled in Virginia Tech's design/buildLAB begin each academic year with an ambitious goal: to bring a community service project from concept through completion by the end of the spring semester. In addition to the usual budget and time constraints, the 15 students taking part in the course during the 2013-2014 school year faced an additional challenge. 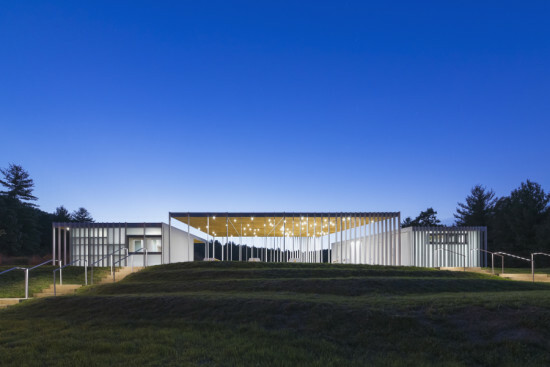 Their project, a public pavilion for Clifton Forge Little League in the tiny hamlet of Sharon, Virginia, was entirely lacking in contextual cues. "It was interesting because our previous design-build projects have been downtown, with lots of context," said Keith Zawistowski, who co-founded and co-directs design/buildLAB with his wife, Marie. "Instead, we had a pristine, grassy field with a view of the mountains. We joke that this is our first group of minimalists." The students' understated solution—three geometric volumes unified by the consistent use of a vertical sunscreen—turns the focus back to the pavilion's surroundings with a restrained material palette of concrete, glass, and steel. Design/buildLAB assigned a separate structure to each element of the Sharon Fieldhouse program, nestling the open-air public pavilion between glass boxes containing the restrooms and concessions kitchen. Different roof heights distinguish the spaces, yet a common material vocabulary and their arrangement along a single horizontal axis allows them to be read as a single object. "The students describe the field house as a linear incision through the site," said Zawistowski. "Basically it's just light cut through the green landscape." Because Sharon Fieldhouse is intended for seasonal use, the students focused on maximizing environmental performance for the warmer months of the year. "Everything's about cooling and ventilation," said Zawistowski. A no-energy ceiling fan cools the kitchen, and tempered laminated white glass helps cut solar gain inside the enclosed areas. "The glass has a translucent quality, so that the spaces are bathed in even light, eliminating the need for electrical lights during the day," explained Zawistowski. The external sunshade, comprising vertical steel plate elements painted white, serves both conceptual and practical ends. "The shade screen is about intimacy and privacy—not just under the open-air pavilion but in the enclosed spaces," said Zawistowski. "The elements vary in density. They're tighter together toward the more private parts of the building." At the same time, larger gaps between the screen's members on the east side of the pavilion welcome in the morning sun, while to the west the steel bars draw together to provide afternoon shade. The screen simultaneously functions as skin and structure. "In most cases, the sunshade is tacked on. In this case it's part and parcel of the architecture," observed Zawistowski. Wider steel bars take the weight of the building's roof, and help conceal downspouts. "Everything is hidden there in the screen," said Zawistowski. "We brought a new group of students to the field house and asked them if they could figure out how rainwater could get off the roof. They didn't know." The students prefabricated portions of the pavilion at Virginia Tech's Blacksburg campus, panelizing the screen members and roofing. "One thing that bothers us in design-build education is that multiple generations tend to work on one project," said Zawistowski. "It's important for us that the same group sees the implications of what they design, so we rely really heavily on prefabrication." On campus, he added, students are able to take full advantage of the university's resources. Once on site in Sharon, the students completed assembly in just a couple of weeks. Given the fact that his students conceived of, fundraised for, programmed, planned, designed, and built Sharon Fieldhouse in less than ten months, it's no surprise that Zawistowski refers to the supernatural when he talks about the project. But when he brings up hocus-pocus, it is as much about the pavilion's aesthetic impression as it is about the speed with which it was brought into being. "We say that it's put together with magic," he mused. "All the connections are hidden—everything's just light and shadow."